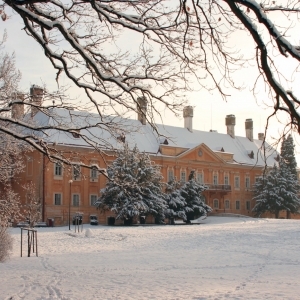 The Pálffy manor house is one of the cultural and historical monuments of national significance, recorded in the list of monuments of the municipal town of Malacky in the Western Slovakia. The manor house has a rich history; having served not only as the residence of a noble family, but also as a Franciscan dormitory, or even an army warehouse and hospital. Originally, it was a Baroque representative aristocratic residence. The manor house is a four-winged, enclosed building with an inner courtyard. The original owners were the Pálffys. The building was rebuilt several times. At the beginning of the 19th century a radical reconstruction of the manor house was carried out, during which the original look of the facades was changed and the interior was rebuilt in Classicist style. The Baroque garden was replaced by an English park. According to historical data, the manor house and the park were surrounded by a stone wall. After the renovations, the manor house was given its present appearance. The balcony over the main entrance and rare French chimneys on the roof remained of the original facade. The interior of the mansion was originally decorated with hunting trophies, a collection of weapons and precious furniture. The manor house has two over ground floors and spacious underground premises, with presumed underground passages from the castle. The courtyard's main feature is the well with a statue of a deer, originally made of bronze. Nowadays, its replica is made of epoxy. There is also a sundial. Three gates led to the castle. The Black Gate made of wrought iron that is still standing, the White Gate leading to the park from “Rádok” and the Red Gate, which served as a supply route the castle. 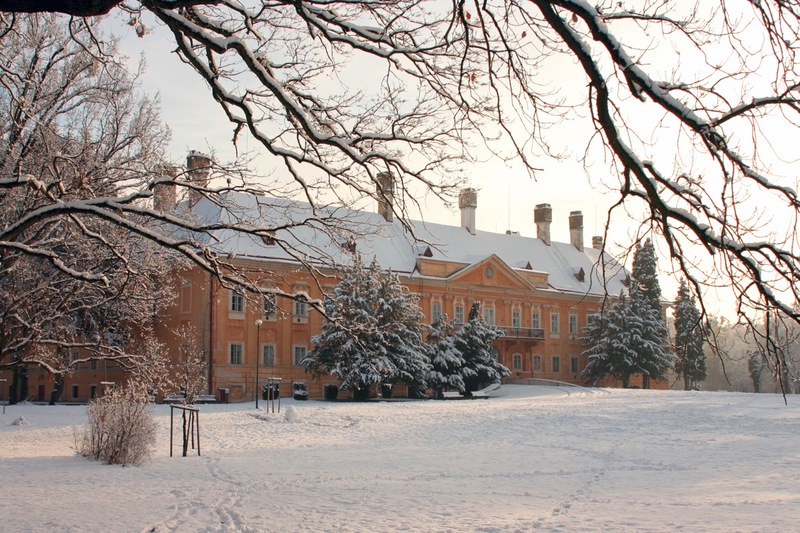 After 1918 the manor house was occupied by the officers of the liberation Czechoslovak army. In 1934, the mansion and the park were acquired by the Franciscan order of St. Francis of Assisi. After 1945, occupants of the castle varied. Between 1944 and 1945, participants of the Slovak National Uprising were imprisoned and tortured here by the German Gestapo. The manor house was used as barracks after the war. After 1957, a hospital was established here. Since 2007, the manor house is owned by the city that has been gradually rebuilding and opening it to the public. In the framework of the “Paltour” project the left side of the front wing was reconstructed and exhibition and conference rooms were established here. With the help of sponsors, the well on the courtyard, entrance gate, the space behind the gate, and staircase with crystal chandeliers were reconstructed as well. The fountain in front of the southern wing of the manor house was renovated, too. There is the Pálffy room with antique furnishing in the reconstructed part of the manor house. Visitors can view the permanent exhibition of photographs documenting the reconstruction of the manor house. Exhibitions are held in the exhibition rooms, especially art shows. In 2012, the manor house in Malacky received the honourable recognition of the Ministry of Culture of the Slovak Republic in the Cultural Monument of the Year contest. The expert jury appreciated the town's honest effort to open the mansion to the public.